Fraudsters prey on our emotions and love to make us panic into the wrong decision. Receiving a phone call or a knock on the door from someone pointing out the dead rats in your garden is sadly a great way to get victims to pay for immediate “special price” help from an exterminator. 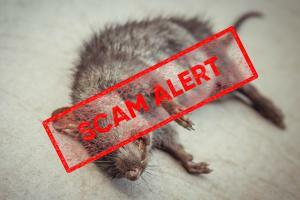 Of course, these people don’t have a rat problem and the fraudsters have put the dead rats there in the first place and it’s all just a scam to get victims to pay for something which they don’t need and is not properly done. Doorstep crimes still make up 5% of all fraud crimes reported, however more worrying is the fact that 85% of victims are over 65. No Cold Callers – signs on your front door are a good idea, Reassura members can call us and to receive such a sticker.